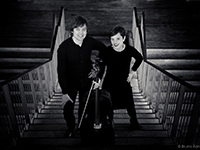 Bach in the 19th Century: pianist Artem Belogurov and cellist Octavie Dostaler-Lalonde present a lecture-recital historically-inspired by 19th century performance practice. Program includes suites of J. S. Bach, and Heinrich von Herzogenberg’s Sonata No. 2 for cello and piano.